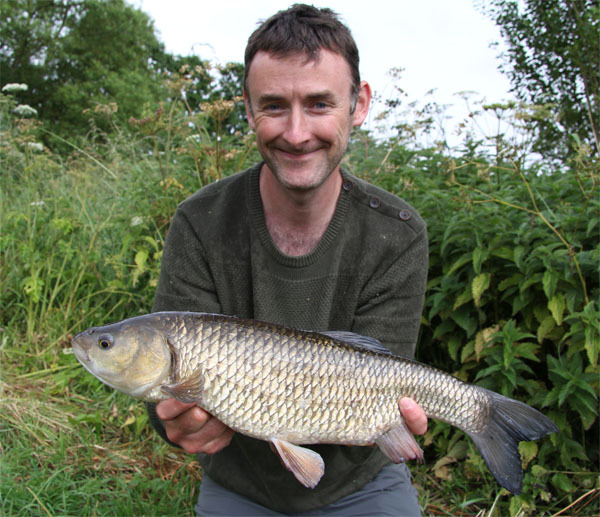 Now Gareth is a good carp fisher who unlike many likes to fish the river in winter when the carp fishing slows down, and over nighter’s are more difficult as you need to set up and pack up during the hours of darkness. He asked me to show him some of the techniques I use to fish for chub on the Bristol Avon. We were going to cover swim selection and methods used so that he could go back later in the year. We met at 7.30am at the Red Lion car park at Lacock. The weather was set to be fair for the day with a possibility of some rain in the afternoon. We made our way to the fishery and soon baited up a few swims with hemp and pellet. The first approach was ledger with pellets on a semi bolt rig. 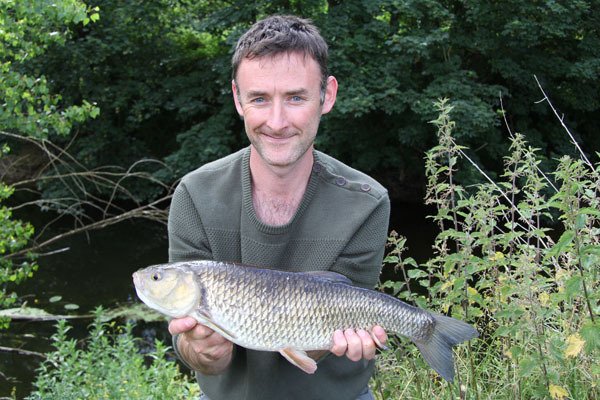 It was fascinating for Gareth to see the chub feeding on the pellets we threw in. Also the way the hemp attracted them out. I always like to show people the pulling power of hemp on all sorts of fish. Sure enough it was great fun seeing them scouring the bottom. We baited 5 swims and saw chub in most. One or two larger chub were behind a bush which was almost mission impossible, however as we said it had to be done! We first started in a swim with a high bank directly above the feeding chub. He used his quiver rod and 6lb line as there were few snags around. He cast out and soon the chub came up onto the baited area and bang the tip banged around and an angry chub was pulling towards the cabbages on the far side and Gareth did a great job in guiding it away. We landed it upstream as the bank sloped down towards the river. So a nice chub lay in the net and after 5 mins of fishing was all it took. Gareth said it’s all about the baiting and not fishing. It was probably after an hour of arriving before we hooked this fish. So bait, look and decide before fishing. 1 oz below Gareth’s pb. So mission accomplished we tried again however the fish were spooked. I did say that normally one fish from each swim is about right before moving on the the next. We fished towards the bush where the larger chub were next. But the little darlings were smarted than us as we had to scale up the line to 12lb and a 2lb t/c rod as there was a barbel there too. Frustrated and after a couple of pickups we moved on. The other swims had chub in them however nothing much showed. We tried but with the water very clear they were very shy indeed. It was getting nearer lunch time and with only one fish to show for our efforts We needed another one quickly. We wandered downstream and found a few more chub taking crust off the top. Plus another swim with some good fish too. We tried this one first however nothing much came along after 15 mins. We moved down to the crust taking chub swim and fired out some more crusts and we could see them coming up for them. There must have been 10 of them. You could see them clearly and they could see us too I guess. We tried crust on a float rod and 6lb line straight through. There were a few reeds etc so we couldn’t go much lighter. Well that’s two fish in the morning which is not the result I wanted. We could see the chub however they were shy. We had lunch regrouped and moved to another swim. Here the hemp was put in together with some pellets and bingo the chub came out to play. Some looked to be over 4lbs and one or two larger. Then out came barbel and fed a little before going back under the cover. This happened a few times. So out came the 12lb line and 2lb t/c rod for action. It didn’t take long for the chub to return after scaring them with the cast. What is great about this fishing is that you can see the chub come up getting nearer the bait until bang the rod goes around and the chub is hooked. This happened quickly and with me giving Gareth a running commentary. He did a great job in keeping it from snags and we landed it just downstream from some reeds. Wow a lovely fish and the biggest of the day, 4lbs 6oz and a new pb. I think we recast again and had another chub of about 3lbs quickly. To get two from the swim quickly is great. Also they were still feeding. 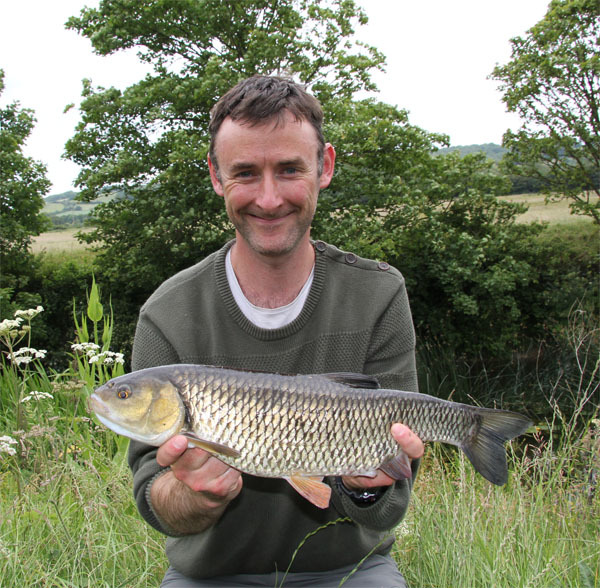 However we thought that we would try another swim even further downstream where we saw plenty of chub again. This time we didn’t bait with hemp and just a few pellets were tossed into the swim. The best bet was the far side where the majority of the chub were. After 10 minutes or so no action came our way however a chub under our feet kept coming out to feed on a few pellets that I had thrown in. So we slowly lowered the baited hook onto the spot. What happened next was something I have only seen once before. The chub came up took the bait and then shook it’s head trying to throw the hook and all was happening on the rod tip was a slight pull and tremble. Boy was it shaking it’s head. Then the hook was out and it shot back under cover. That was the last we saw of that chub. One other chub came up and tried the bait and made a mistake and the tip flew around and Gareth stopped it going into the snag, so a bit of hook and hold. The 12lb line and rod was more than a match for this chub that was about 2lbs. Great fun though. We left this swim and went back to the one with the barbel in and we saw two this time.One looked a double too. So we decided to stay put and see if we could capture one of the barbel. There were still chub feeding on the hemp and guess what we caught 3 more of these. They were not large ones. One had a mark on it’s tail and we thought it weighed about 31/2 lbs sure enough we captured it and it went 3lbs 6oz. Gareth was having the time of his life. 8 chub under his belt and still a chance of a barbel we continued fishing for the barbel. We had a couple of heavy showers that made the bank slippery but we continued. The barbel were laying up very close to the snags and only showed briefly. However time was moving no so quickly we had to pack up and be away. We had a swift one in the Red Lion before saying good bye. me saying that when Gareth does start fishing in the winter I would spend a couple of hours helping him out with float fishing with maggots. So two delighted anglers head off home. This entry was posted on Sunday, June 28th, 2015 at 12:14 pm	and is filed under Uncategorized. You can follow any responses to this entry through the RSS 2.0 feed. Both comments and pings are currently closed.